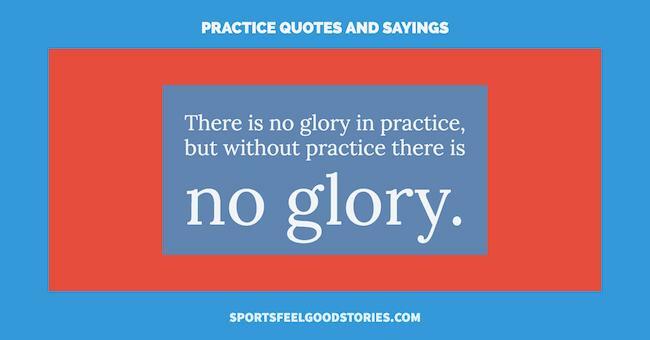 A quick review of these practice quotes and sayings will give you a sense of how importance practice is linked to achievement. Practice is the most important thing when it comes to succeeding in any field. While perhaps most closely associated with sports, it is hard to maintain consistent achievement in any field without regular practice. “Practice makes perfect” is an age-old dictum that you may have been hearing all your life. There is a reason why generations after generations have used this saying. As an athlete, practice is one of the few things that you control that can help you excel at your sport. Your motivation, gear, nutrition, and all the professional and familial support are important, but it is practice that contributes the most to your success. Here are some inspiring practice quotes and sayings to give you more reasons to increase your hours of practice. We encourage you to share these sayings with a friend or teammate who needs more inspiration. The only way a kid is going to practice is if its total fun for him… and it was for me. I don’t know if I practiced more than anybody, but I sure practiced enough. I still wonder if somebody — somewhere — was practicing more than me. It is the hours, the tenacity, the work, the hanging in and doing again and again just to understand some technique. Tip: Use these practice quotes on communications to your team, texts, photo captions and more. Practice doesn’t make perfect. Practice reduces the imperfection. …never stop learning or working for what you want. Nothing comes easy, ever, if you want something, you have to work for it. By working for it I mean work on your craft, learn from people who have something to teach. It’s just like anything else, practice makes perfect. It is not that practice makes perfect but that practice is perfect, combining effort with an openness to grace. You have to work from one point to go to another. So I admire work ethic, I think it should be reinforced through our neighborhoods, that everybody should work hard, practice makes perfect, you have to be diligent with what you want, you have to apply yourself, you have to motivate yourself. To sum up: it’s time to rewrite the maxim that practice makes perfect. The truth is, practice makes myelin, and myelin makes perfect. You need to put what you learn into practice and do it over and over again until it’s a habit. I put a lot of emphasis on the necessity of continuing to work, that good art practice is a product of practice, practice, practice. Practice like good musician; draw every day. The first essential to success in the art you practice is respect for the art itself. In previous years I was so fired up at times I made little mistakes. So I kept telling myself to be patient, relax, play like you do in practice. What I’ve been doing in practice will carry over into the game. There is a way to practice hard and be physical without pads. The 49ers practiced like that for a long period of time in the 1980s under Bill Walsh and were extremely successful when all the other teams were practicing in pads. You might not feel good, and you might not want to practice, but you still go out there and practice as hard as you can. But I still have to practice hard if I’m going to play my best tennis. Practice the game the way you’re going to play the game. Practice hard and play hard. Run hard and above all else, hustle every moment you’re on the field where you are practicing or playing in a game. Study hard, practice hard, play ferociously. If you practice hard, you can win every battle. Just practice hard and stay grounded. Treat people like you want to be treated and work hard. If you have more suggestions for practice quotes, please send them our way via our Contact page. Thank you!